Colombia's new defence minister, Juan Carlos Pinzon, has been sworn in, with orders to give the "final blow" to the Farc rebel group. Mr Pinzon is an economist, a former deputy defence minister, and a close ally of President Juan Manuel Santos. He was brought in to replace Rodrigo Rivera, amid a growing perception that security gains are being reversed. Mr Pinzon has promised more innovation in tackling Marxist guerrillas and ending Colombia's 47-year conflict. "We are right in the moment of confrontation, when it is again necessary to innovate and respond effectively to the challenges that we face," Mr Pinzon said at his inauguration ceremony in Bogota. "The order I have received from the president is to act decisively and generate results," he added. Colombia's security situation has improved greatly over the past decade. Backed by aid from the US, the armed forces have regained control of large areas of the country from the Farc (Revolutionary Armed Forces of Colombia) and killed several of their top commanders. President Santos took office last year promising to maintain the tough security policies of his predecessor, Alvaro Uribe. But rising casualties among the security forces in recent months have fuelled the perception that the Farc and the smaller ELN rebel group are reversing some of those gains. The rebels have changed their tactics, hiding among the civilian population to avoid attack and stepping up their use of explosives, the BBC Colombia correspondent Jeremy McDermott says. Mr Pinzon said he would seek to develop new strategies to confront the rebel groups, making greater use of technology. 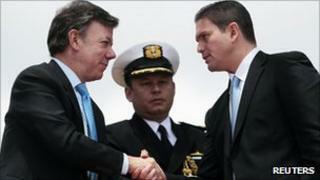 He also promised stronger action against drug trafficking, which is a major source of finance for the rebels. "Drug trafficking is the worst pain that has plagued Colombia," he said. "It remains the fuel of all crimes in the country and we must continue fighting it". But he said the armed forces must act with full respect for the law and human rights. "We must fulfil our duties with ethics and transparency, as well as zero tolerance for corruption," he said. Colombia's security forces have been accused of widespread atrocities in their long fight against left-wing rebels, including the murder of civilians who are later passed of as guerrillas killed in combat. Mr Pinzon's instructions to strike the final blow against the Farc are the same orders that Colombian defence ministers have been receiving for 47 years, the BBC correspondent in Bogota says.